Deep bins for extra-capacity storage. Four compartments for rubber bands, paper clips, push pins and more. Two longer compartments accommodate pens, scissors and rulers. 15.25w x 11.8d x 2.37h. Four compartments to organize supplies. Longer compartment for oversized items. 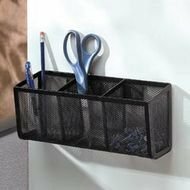 Organize home or office with the contemporary liik of sturdy rolled steel mesh accessories. Classic styling coordinates with many decors. Features two compartments for pencils, pens, scissors and more. Two side compartments perfect for memo pads and messages. Also accommodates a 3"x3" note pad. Made of durable rolled mesh steel, the unique crisscrossed design gives your workspace a curb appeal all its own. 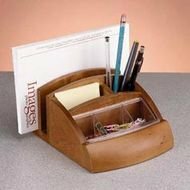 Great for both home and office settings. Creates a productive workspace and a fashion statement for your desktop. Keeps your desktop organized and supplies close at hand. Keeps pens, pencils, scissors and more organized on the desktop. By combining rounded curves and the natural aesthetics of real wood, the Expressions Wood Series creates a contemporary, sleek new look that will add an elegant touch to any desktop. Available in a mahogany or oak finish, this complete desktop organization line is ideal for any office or home office decor. 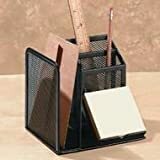 These multifunctional desktop organizers stack to utilize vertical desktop space. 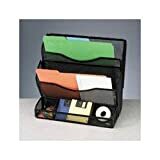 Great for storage of CD's, pens, disks, etc. 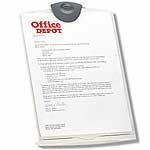 Utilizes vertical space for displaying and storing PDA's and cell phones. 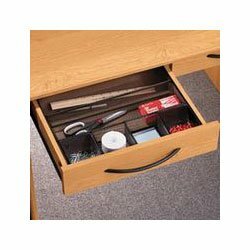 Two convenient storage drawers hold frequently used office supplies. Center compartment holds business cards in front, pens, pencils, scissors and more in back. 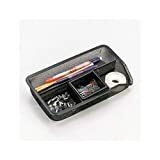 Three compartments for rubber bands, paper clips, push pins and more; one longer compartment for pencils, pens, and highlighters. Popular mesh metal design adds a contemporary flair. 10.8w x 6.3d x 2h. Three-compartments for storing everyday office supplies. Perfect for use on file cabinets. Center compartment accommodates water bottles or cans. Strong magnets stick to most flat metal surfaces. 12w x 4d x 5h. Mesh design gives your workspace "curb appeal". Adds efficiency, productivity, and a fashion statement to your desktop. Three-Compartments for storing everyday office supplies. Center compartment accommodates water bottles or cans. Two extra capacity file pockets accommodate letter and A4 size folders. Three-section organizer in frontideal for pens, paper clips and disks. Curved front design for easy access. 13-7/8w x 8d x 12-1/2h. Express your distinct style and taste with this elegant addition to any office décor. Unique combination of solid wood and frosted plastic with soft, contemporary curves. Five compartments keep pens, clips, notepads and other small supplies organized.